Chuy Bubble Gum scent is our ode to all things delicious and fun! huy Bubble Gum Air Freshener & Odor Eliminator captures the scent all things delicious and fun! As a kid, was there anything better than opening up a piece of gum, chewing it up, and blowing the biggest bubble you could? Did you ride your bike to the corner store to pick up your favorite pack of gum, or did you buy it from the ice cream man? Whether you were a fan of Bazooka®, Dubble Bubble®, Bubblicious®, HubbaBubba®, or Big League Chew®, this scent will surely take you back to your childhood. 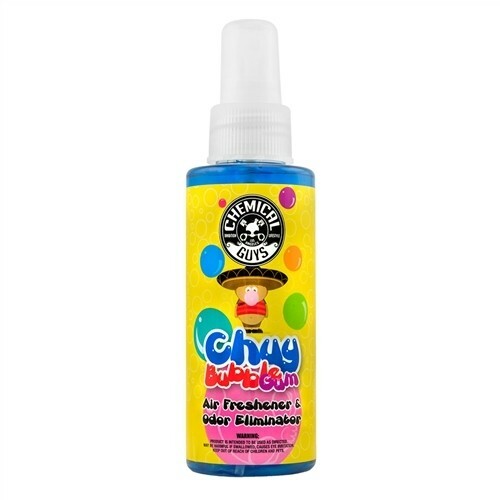 Indulge your sweet tooth every day with Chemical Guys Chuy Bubble Gum Scent Air Freshener!